July 14, 2015 by Emily Brees 3 Comments - This post may contain affiliate links. Easy. Cheesy. Delicious Comfort Food. 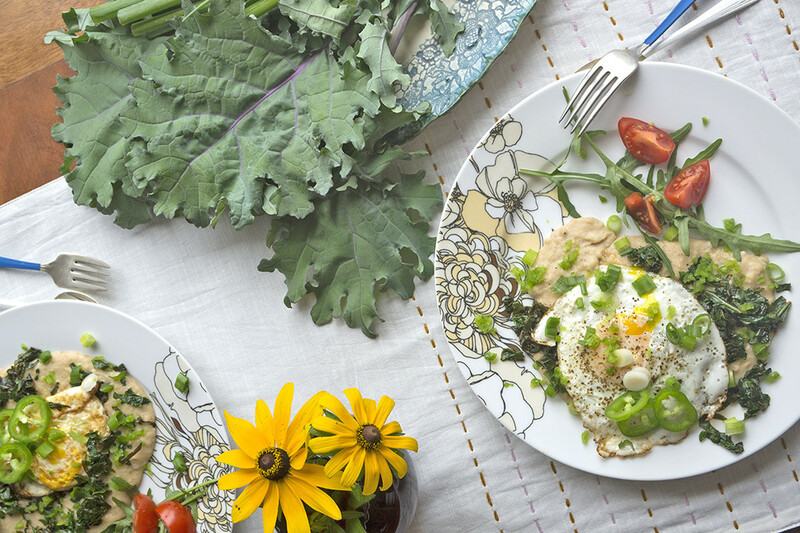 This dish is perfect for breakfast, lunch or dinner! 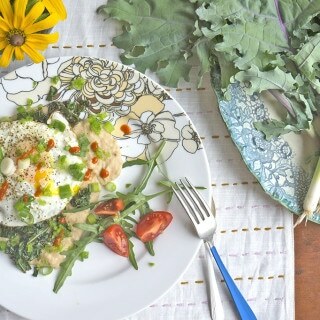 Cheesy White Beans with Kale – topped with a fried egg! My friend Kirsti introduced me to this recipe. It just so happens that her birthday is this week, so I thought I’d share one of her tastiest! It can be served for breakfast, lunch or dinner – it’s comfort food at its finest! 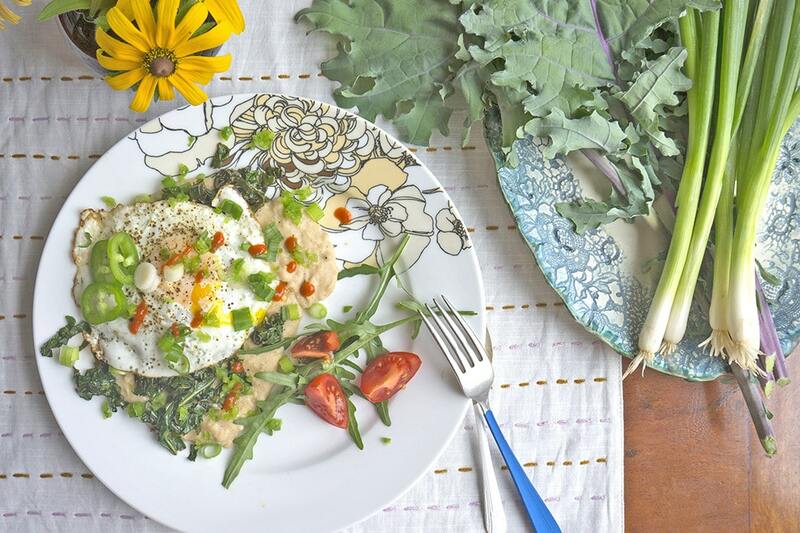 I’d describe it somewhere between savory grits and creamy mashed potatoes – it’s cheesy deliciousness topped with a fried egg and sautéed kale. It comes together quickly and has great flavor! 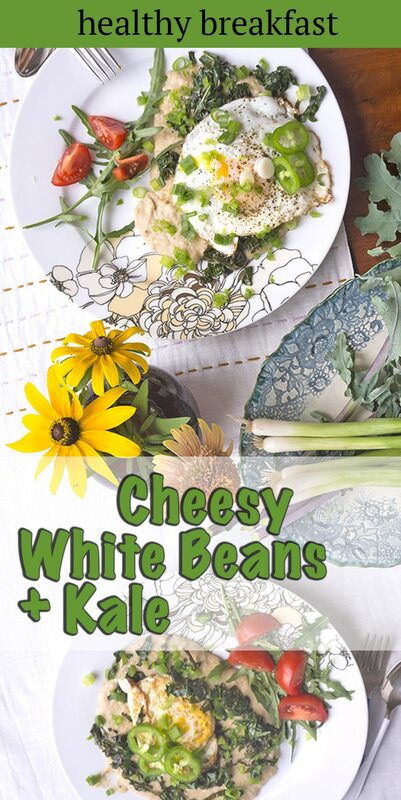 The ingredients are easily interchangeable and it would go well with just about any veggie on top. 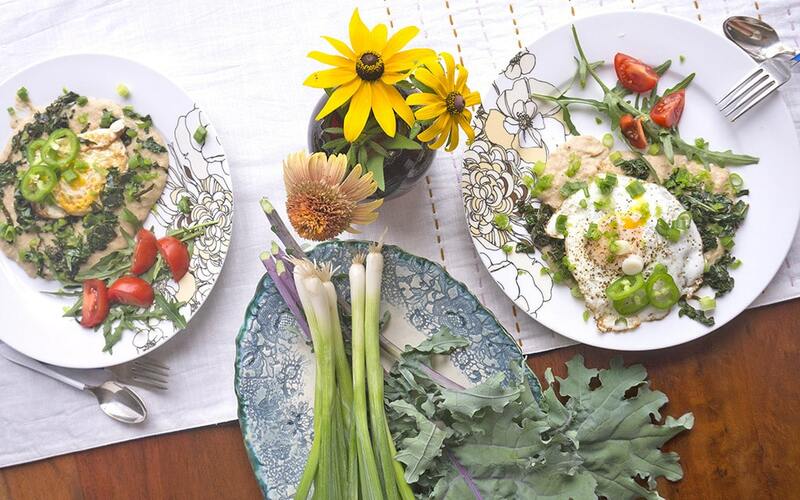 A cheesy blend of white beans with greens and topped with an egg! A great meal anytime! Heat 1 tbsp olive oil over medium heat. Add garlic and cook until fragrant ~ about 1 minute. Add beans, cream, and 1/2 cup water. Once the mixture is warmed through, mash beans lightly with a potato masher or fork. Add water, if needed, to create a loose, creamy consistency. Stir in both cheeses and season with salt and pepper. Turn the heat to low and put a lid on it to keep it warm. Heat 2 tablespoons olive oil in a large skillet over high heat and add kale, season with salt and pepper, and cook, stirring frequently, until it wilts and start to get a little crisp, about 4 minutes. Stir in lemon juice and place in a bowl. Prepare the fried egg. Heat 1 tablespoon oil in skillet over medium-high heat. Add eggs, season with salt and pepper, and cook until whites are set but yolks are still runny, about 3 minutes. It is easier to make them individually if you don't have a large pan. If you prefer to cook the eggs yolks a bit more, put a cover on the pan for a minute. Add the bean mixture to the plates. 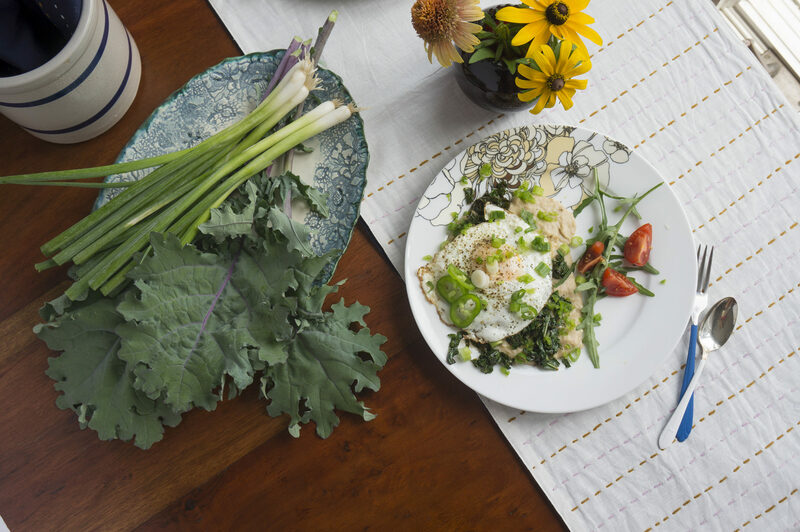 Top with kale, then egg. Sprinkle with scallions and jalapeños. Maybe a little Sriracha and eat up! yum! Your table looks so pretty. Mine is always a disaster!